Policeman dances with cricket fans Jump to media player A policeman joined Pakistan cricket fans celebrating a victory in Luton. Dancing policeman delights drivers Jump to media player A traffic policeman's dance moves have become a Christmas holiday tradition in the largest city in Rhode Island in the US. 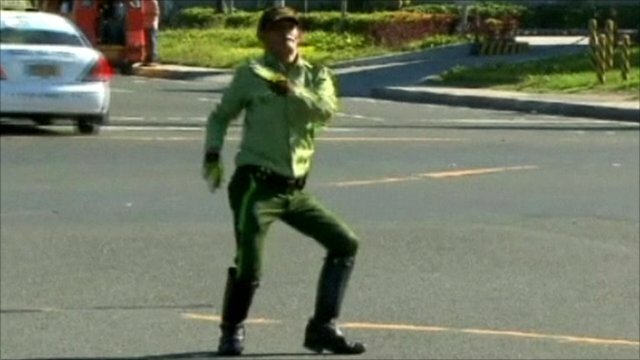 Dancing policeman stops traffic Jump to media player A Filipino traffic policeman has become a street sensation after delighting drivers and pedestrians with his unique dance moves when directing traffic in the capital Manila. Policeman: 'I was daddy dancing' Jump to media player PC Paul Taylor from Darlington says his phone hasn't stopped ringing, since footage of him dancing with fans at the One Love concert in Manchester went viral. A policeman has been filmed dancing with jubilant cricket fans in Luton. It came after Pakistan beat India in the ICC Champions Trophy on Sunday. The video, shot in the Bury Park area of the town, shows a crowd of fans with flags celebrating in the street.